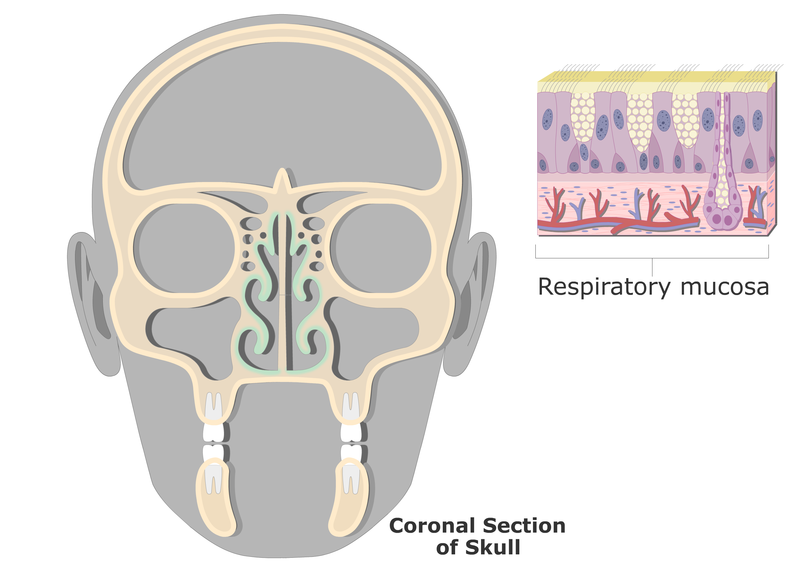 Inside the nasal cavity, the surfaces of the turbinate bones (= nasal conchae) and meatuses are lined (see image below) by respiratory mucosa (= nasal mucosa). 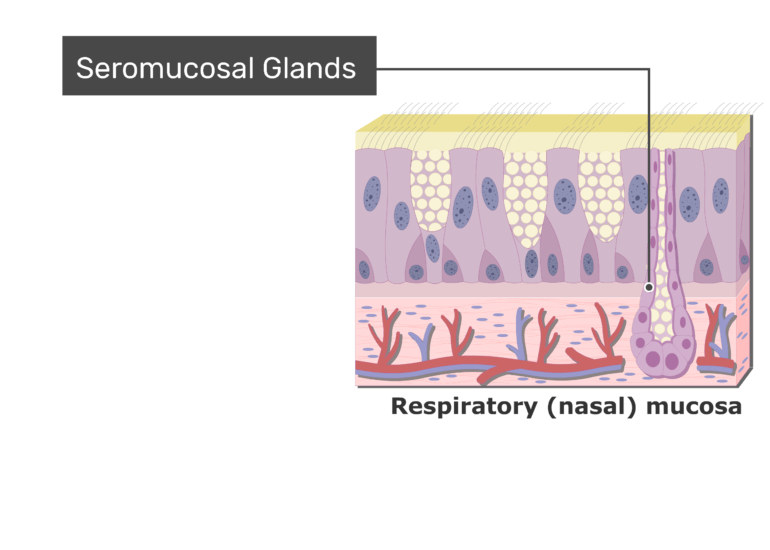 An expanded view of the respiratory mucosa shows more detail about its layered composition. 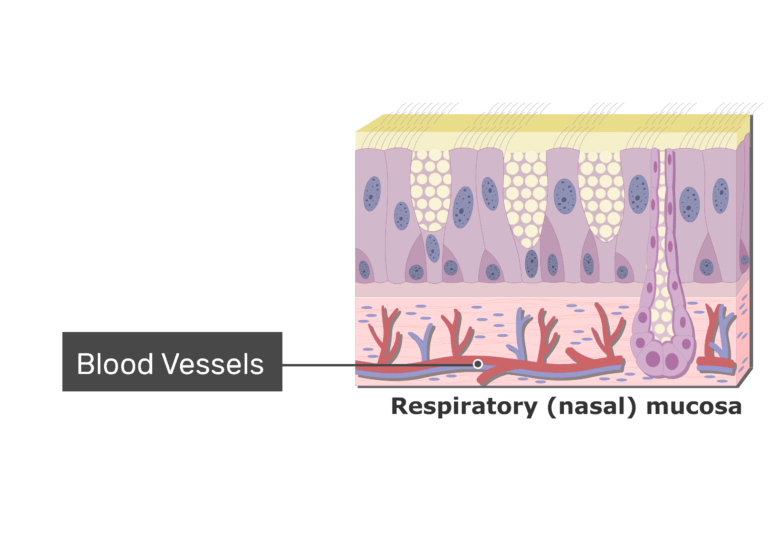 Along the luminal (nasal) surface is pseudostratified ciliated columnar epithelium. 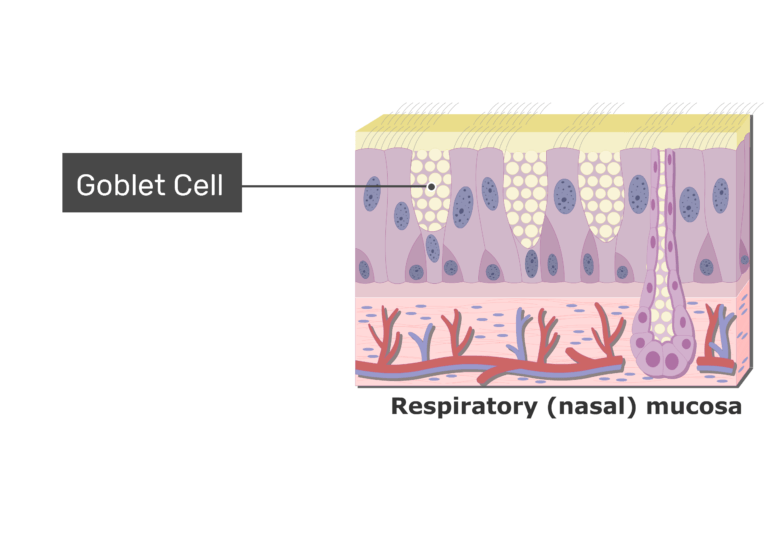 Interspersed among the columnar cells in the epithelium are many flask-shaped goblet cells. 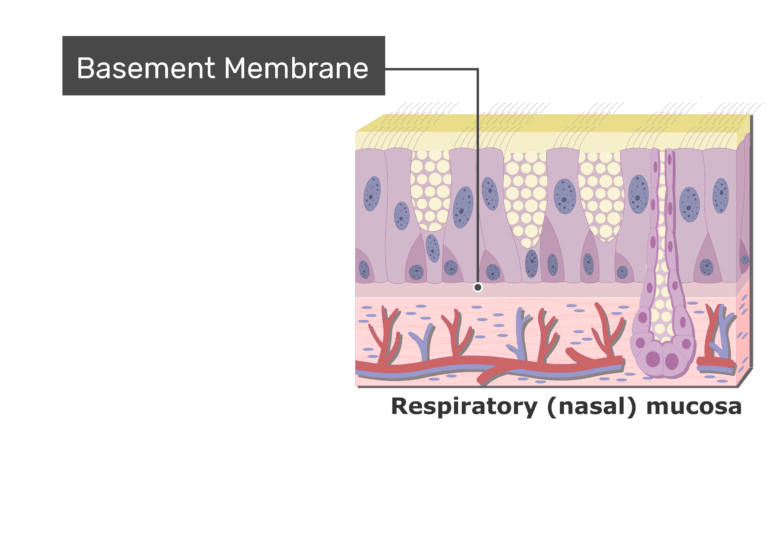 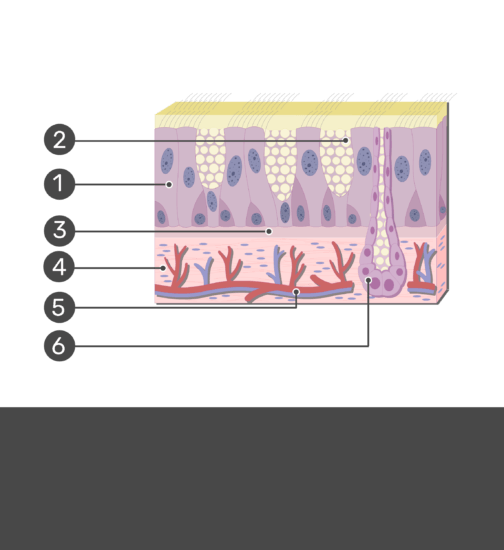 The densely packed cells in the epithelium are embedded in a thin, adhesive sheet called the basement membrane. 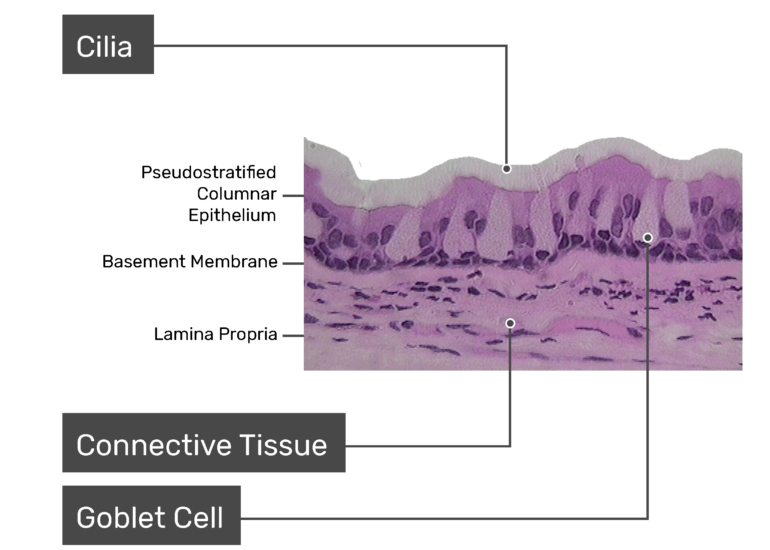 Deep to the basement membrane is a thicker layer of loose connective tissue called the lamina propria. 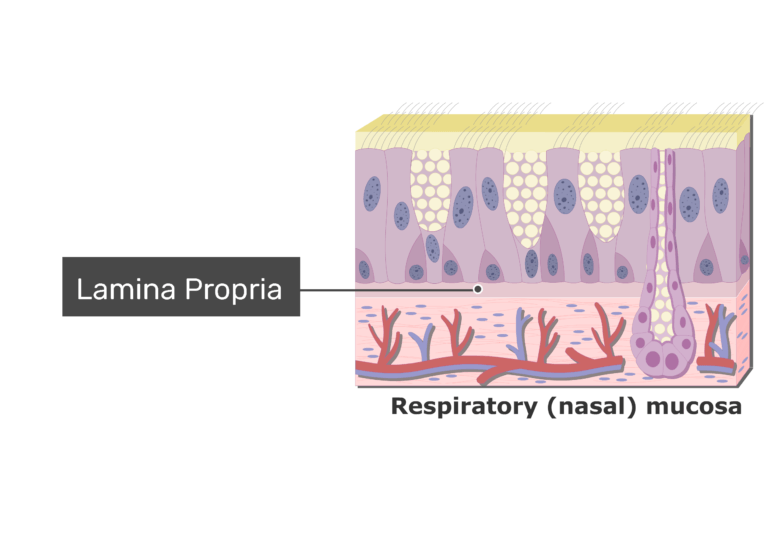 Many blood vessels and seromucosal glands are also present in the lamina propria. 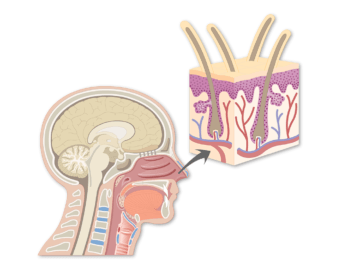 The vestibule is the portion of the nasal cavity that lies directly posterior to the external nares. 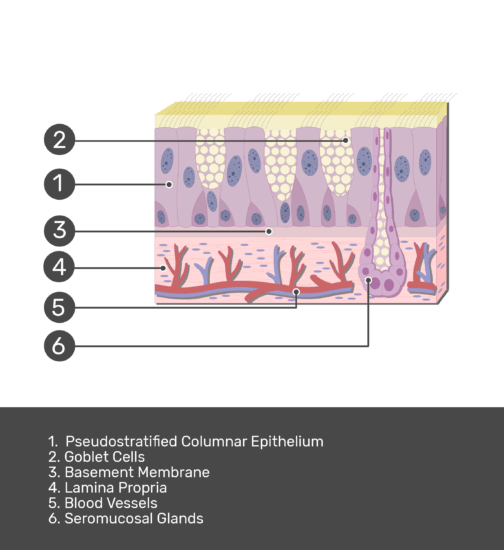 It is lined by stratified squamous epithelium providing as a barrier that helps protect the vestibule from damage. 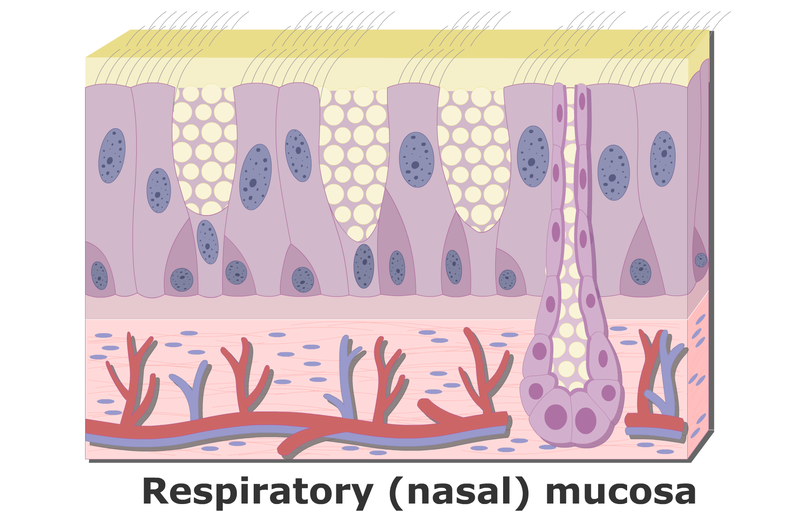 A layer of mucus typically covers the outer surface of the vibrissae. 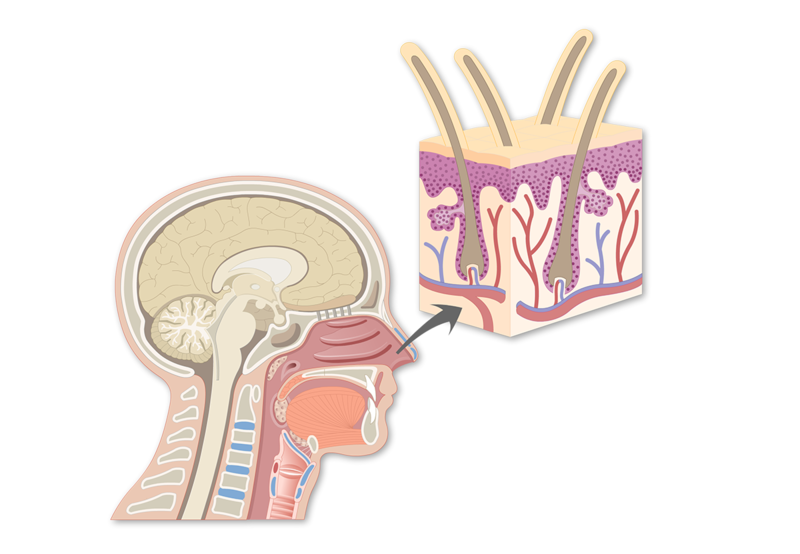 There are three turbinates on each side of the nasal cavity (Superior, middle, and inferior). 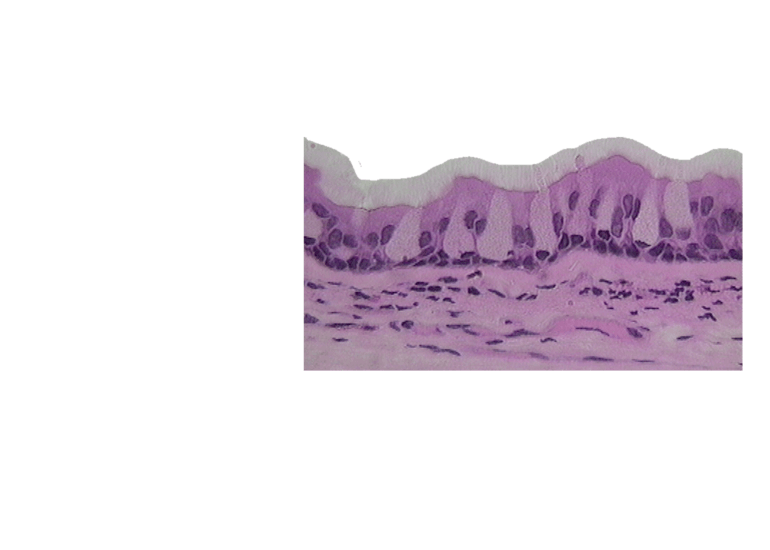 Grooves are found between the curved turbinates. 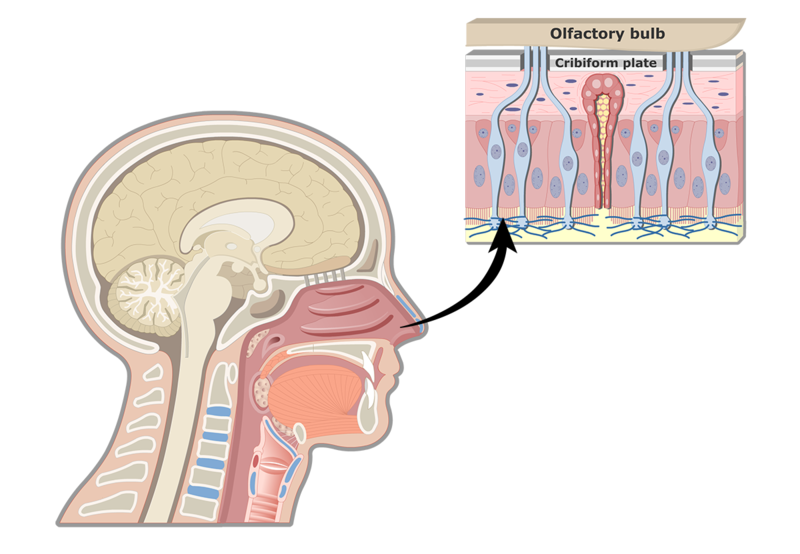 During inhalation, air is directed over and under the turbinates. 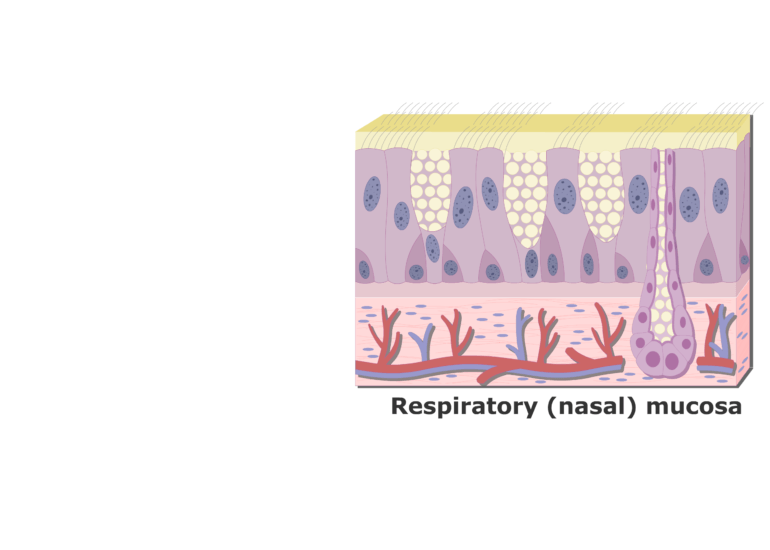 The surface mucosa conditions or prepares the air so it can safely travel into the lungs. 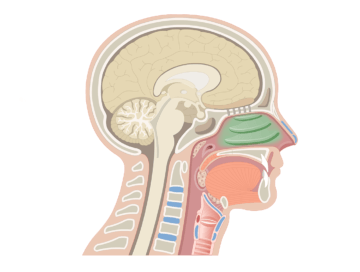 The nose is supported by upper and lower cartilages along with the maxilla and nasal bones. 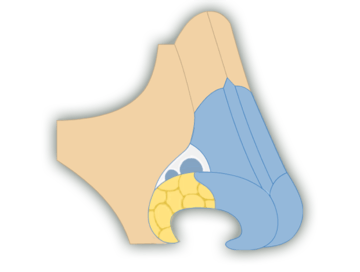 A pair of nasal bones support the bridge of the nose and the medial plates and frontal processes of the maxilla bones support the sides of the nose.